Travel along the coast as Martha showcases the bounty of the Arabian Gulf. Each dish highlights the local catch with shrimp balls, chilled mussel salad, calamari with vermicelli, lemon and herbs, and fish with tamarind sauce. These recipes are sure to bring out the seafood lover in you. 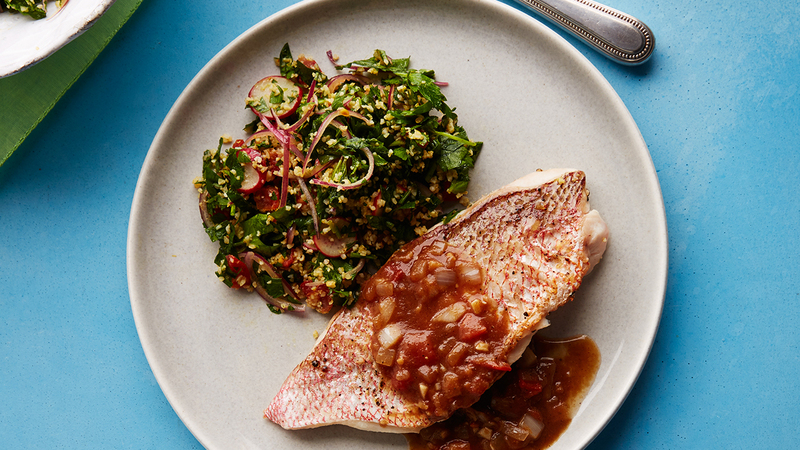 This fish with tamarind sauce recipe appears in the "Coastal Favorites" episode of Martha Stewart's Cooking School. Place tamarind in a medium bowl and cover with hot water. Let soak for 15 minutes; mash tamarind. Strain through a sieve, pressing on solids and scraping the bottom of the sieve to remove pulp. Discard the seeds and set strained liquid aside. Heat oil in a large saute pan over medium-high. Add onion and garlic and cook, stirring often, until golden, 5 to 8 minutes. Stir in tomato, sugar, coriander, cinnamon, cumin, 1/2 teaspoon salt, 1/2 teaspoon pepper, and reserved tamarind liquid. Simmer for 20 minutes, stirring occasionally, until sauce is thickened. Add more water if sauce becomes too dry. Stir in 1 tablespoon butter and season with salt and pepper; keep sauce warm. Season fish with salt and pepper. Melt remaining 2 tablespoons butter in a large nonstick skillet over medium-high heat. Sear fish skin-side down, turning once, until cooked through, 2 to 3 minutes per side. Spoon sauce over fish and serve with parsley salad. Gulf-Style Parsley Salad: Place onion in a small bowl and cover with ice-cold water. Let soak 10 minutes. Drain and pat dry; set aside. Place bulgur in a fine-mesh sieve and rinse until water runs clear. Transfer to a large bowl. Add tomatoes and lemon zest and juice; stir to combine. Remove greens from radishes. Thinly slice radishes using a mandoline and finely chop greens. Add radishes and greens to bulgur mixture along with parsley, mint, spices, oil, and reserved onion. Season well with salt and stir to combine.